Vs. Mach Rider © 1985 Nintendo. Super Smash Bros. Melee (Nintendo GameCube) has a remix medley of the Mach Rider soundtrack. On the Fighting Course version, you travel across 10 sectors, and try to avoid being destroyed by obstacles and enemies. 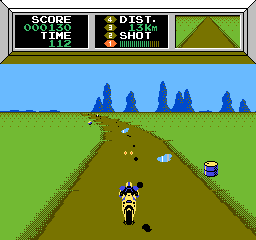 In Endurance Course version, you race a certain amount of miles within a time limit while enemies get in your way and try to throw you off course.